Hotel Days Inn by Wyndham Red Wing, Red Wing, United States of America - Lowest Rate Guaranteed! Located in Red Wing, Days Inn by Wyndham Red Wing is within a 5-minute drive of Colvill Park and Barn Bluff Park. This hotel is 32.3 mi (52 km) from Afton Alps Ski Area and 1.4 mi (2.3 km) from Sorins Bluff. Close to Bill's Bay Marina. Paint peeling on front door and in bathroom. Hot tub luke warm and jets very weak. The room that I stayed in had a very weird smell. My daughter had to pray some body spray in it just so the smell wouldn't make me sick. Clean. Staff was accommodating when we needed a few extra minutes to check out. There was a "whirring" noise of something running but didn't sound like it was in our room. There was probably no way to stop the noise. Putting the heater fan on took care of masking the whirring sound. It was tolerable. The hotel was an "older" motel - kind of cramped. 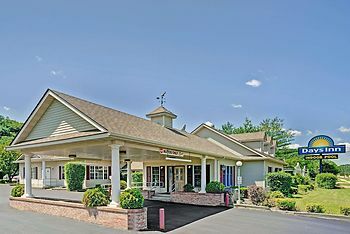 The picture in the ad online was probably a new version of a Days Inn and not the actual facility we stayed in. The bed was VERY firm and you could feel the coils but we slept well and soundly even the first night. All-in-all it was fine, just different than we anticipated. We enjoyed the weekend. Very outdated, need new tv's and lighting. Skimpy on the towels. Logos, brands, and other trademarks featured within this site are the property of their respective trademark holders. These trademark holders are not directly affiliated with Hotelsone. Days Inn is a registered trademark.© 2001 - 2019 HotelsOne. All rights reserved.